- Take exit 11 (Lelystad Noord) from the A6 motorway. - At the end of the slip road, head for Batavia Stad (Houtribweg/N302). - After 2.5 kilometres, get in the left-hand lane at the junction. - Take the third turning off the roundabout (Houtribweg), towards Lelystad/Batavia Haven. - Take the first turn off the next roundabout (Museumweg), towards Batavia Haven. - Continue straight on at the roundabout (VOC weg). You will the entrance to the VOC parking garage in front of you. - Park your car and go up, taking the elevator or the stairs. - The museum will be in front of you. If you walk past it you will see the Batavialand shipyard on your left-hand side. Fixed parking rate of €3.00 per day. Payable on arrival or departure. Payment options: cash and bank card. The Oostvaardersdijk across from the shipyard entrance in Batavialand has four disabled parking spaces. Take exit 11 (Lelystad Noord) from the A6 motorway. At the end of the slip road, head for Batavia Stad (Houtribweg/N302). After 2.5 kilometres, get in the right-hand lane at the junction. Take the first turning off the roundabout (Markerwaarddijk) towards Enkhuizen. 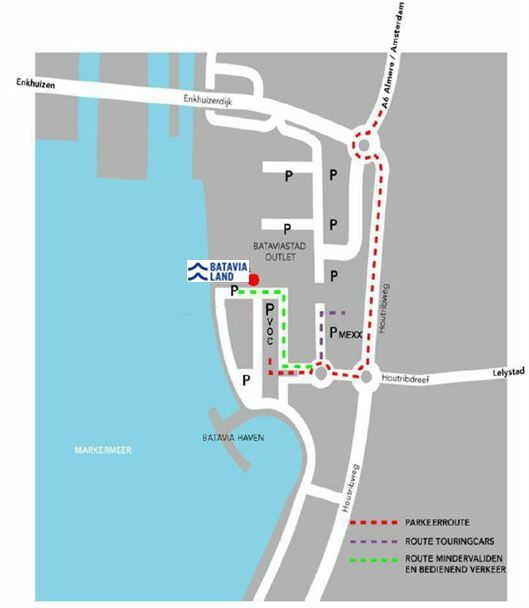 Follow the signs for Batavia Stad (with the bus symbol). Walk towards the coast for 10 minutes and you will soon see the Batavia ship. If Leaving from the Lelystad NS train station, city bus number 3 goes every half hour. It will take you to its destination (Batavia Stad) in just ten minutes. The bus stop is directly in front of the NS station. For the timetable, please refer to the 9292 website and Arriva. Multiday closure between Friday 27 July and Monday 13 August. See the factsheet for more information.